We turn off the engine of our game drive vehicle and sit quietly. We are in the grasslands of Ol Pejeta Conservancy, at the foothills of Mount Kenya, on those immense plains with just miles of gold green grass interspersed by the occassional groves of Acacia shrubs and trees. The wind blows through our hair and we smell a fresh perfume peculiar to the vegetation. Through the chirping of the innumerable birds – they are flitting around in all that grass and in those shrubs – a soft whistling sound comes through. We begin driving slowly. And brush past one of those bushes that abound all around. Vicious looking thorns stick out in all directions. There are some bushes that are just silvery white and light brown – all stem and thorns with small brownish-black bulbs every few inches along the branches. Other bushes have tiny green leaves that seem somehow too delicate to grow amidst all those sharp ends.A strange looking plant. Even more incongruous is the sight of several nests in between those branches or a giraffe feeding on those leaves! The whistling continues unabated. Surely no bird has such a loud voice or so long a breath? We decide to ask our guides Martin and Oliver (from Porini Rhino Camp of Gamewatchers Safaris Ltd.) … or begin to, and stop suddenly to exclaim “Ants” !! Our game drive vehicle, our bags, our very selves are covered in ants. Hundreds of them. And we had not noticed because they had not bitten us! Where did they all come from?? And this time, we did ask our guides! Oliver turned around, took one look at us and pulled off to the side of the track. His first comment was “I thought they were only on me. They came from the bush we brushed against a while ago.”. Now that is an interesting reaction – most people who find themselves covered in ants would want to shake them off – as we did. And he had just carried on driving … After we manage to brush off as many ants as we can lay our hands on, we carry on with our safari. Later that day, we go on a bush walk. Our walking guide for the evening, Benjamin, stops near one of those acacia bushes and taps one of those thorny branches. Out pours a whole colony of ants, all with their little tails in the air. Wherefrom did they come? It is like a magician pulling a rabbit from his hat! Benjamin treats us to a short botany-zoology lesson. The little black globules have tiny holes and are apparently hollow. These are the nests for those ants. In return for a safe home, the ants, as soon as they feel the branch shake, come out and attack any potential threat to the acacia – like all those giraffes that want to eat the leaves. Harmonious living. Symbiosis. Cocktail ants they are called. Because someone with a vivid imagination thought “with their tails in the air, they look like waiters at a party carrying trays of cocktails over their heads”!! Or so goes the local legend. The bush has value for the local tribesmen too. 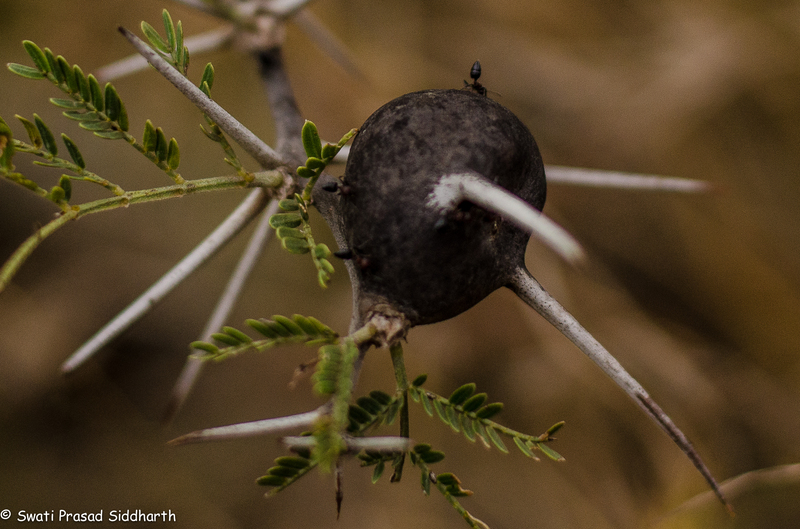 The bark of that thorny bush can be chewed and is a remedy for a sore throat. 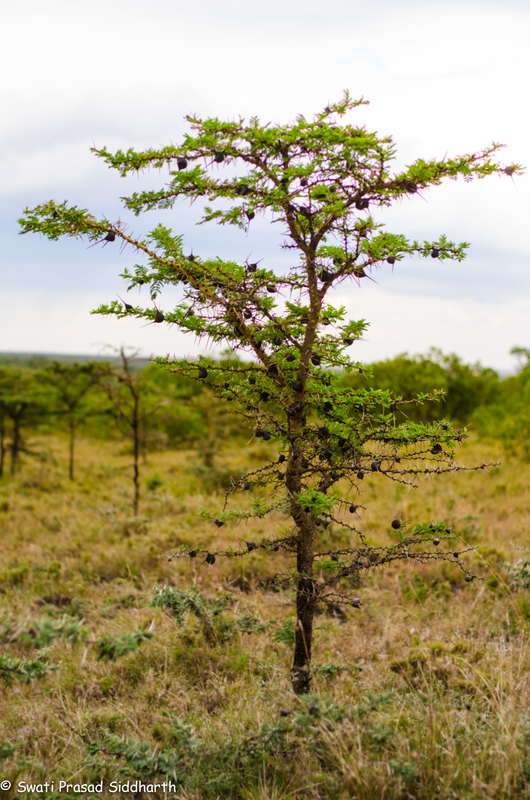 The branches with those thorns are perfect to fence the cattle “boma”s – holding pens – to keep out predators. As for the whistling on the grassy plains? That is the wind going through those little holes in the acacia bulbs, the ant nests – the whistling thorn acacia. 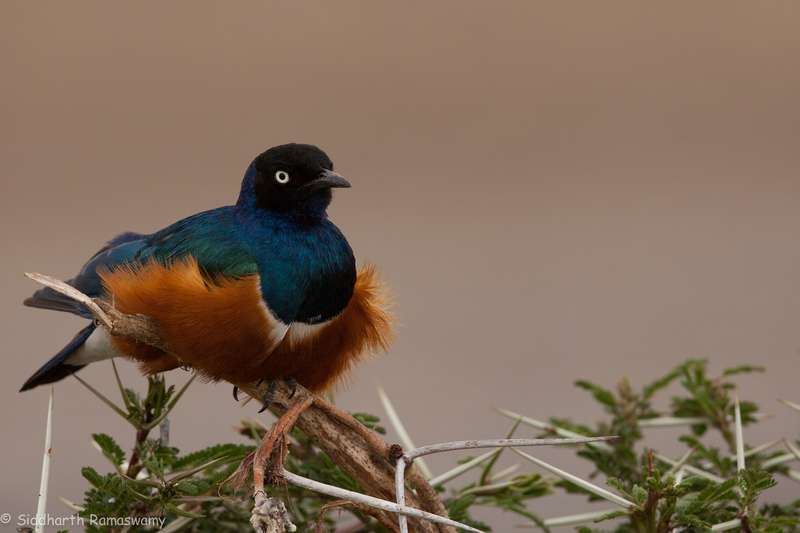 There is no end to the romance of the African bush. Thank-you, Sumati. Unfortunately this time we did not get the ant close ups. But it’s a promise to ourselves that we will get some good shots soon. If it happens, you will see it here! Also, the ants do bite, I understand. But mildly. And we were truly fortunate! We love Africa. And would happily lure the world here if they promise not to poach or overwhelm the land and it’s people. As for style, I believe I have to thank my high school English teacher, a Mrs.Una Fernandez, for whatever facility I have in the language! Looking forward to your keeping your promise, soon! ditto rajpurohit’s comment; i felt. was out there with you in the ant country. do you have a blow-up picture of the cocktail ant? good to know that these ants don’t (didn’t) bite. I have put in 3 photographs plus the cover photo. Are you unable to view them?